Since opening in 2009, Slappy Cakes has become known as one of the most popular and successful breakfast restaurants in Portland by consistently demonstrating superior quality and legendary service in a fun and hip environment. 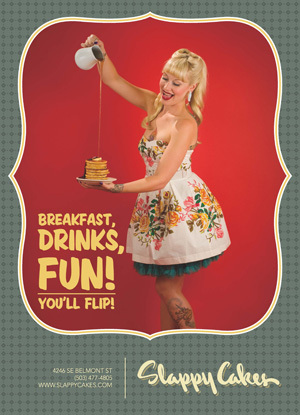 Slappy Cakes has been featured nationally on The Cooking Channel, Woman’s Day Magazine, Rachel Ray, and was awarded the title of “America’s Best” by Food Network as one of America’s top ten destinations, as well as numerous other local and national print media and television programs. The feature that sets Slappy Cakes apart from other breakfast restaurants is that there are griddles built into each table. Guests order bottles of pancake batter with accompanying items and cook pancakes right at their table while also enjoying entrees and drinks with a fresh, local, and organic emphasis.